Ordinance No. 21, Series of 2014 - Ordinance Creating the Internal Audit Office. Ordinance No.1,Series of 2010 - Vigan City Skills Training Institute. Ordinance No.14,Series of 2006 - Amending the Barangay Cooperative and Livelihood Fund. 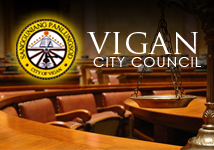 Ordinance No 4,Series of 2004 - A Establishing the Vigan Livelihood Assistance and Employment Generation Program. Ordinance No 7,Series 1995- Establishing the Barangay Cooperative and Livelihood Fund in Vigan.